Panic, confusion and intimidation can paralyze freshmen early in the school year, but there are many ways to lower stress and ease the transition. 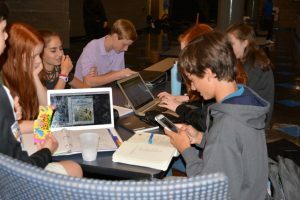 The rotating schedule, the maze of classrooms and the change in academic rigor may seem overwhelming, but to survive the high school experience, it’s crucial to adapt quickly. Below are some tips to help with that process. 1. Build strong relationships with your teachers. Go to extra help both before and after school, visit teachers during a common free and don’t be afraid to ask questions. They are there to help you, and don’t forget that they determine your grade. Also, they provide a great support system for when you are stressed or need academic advice. They want you to be successful both inside and outside of the classroom. 2. Take advantage of your free periods. The reason we have two is to lower stress and help time management, especially with those who have extra-curricular activities. Time management is the key to reaching academic success. Getting homework done at school not only frees up your time at home, but it also allows you the opportunity to see your teachers when you need help. Freshman grades are important, and a productive homework routine established now can serve you well for the rest of high school. 3. Get involved. Playing on a Pace sports team, or being involved in a club, theatre production or community engagement project introduces you to people in different grades and gives you a fun activity after school that doesn’t involve your phone or books. 4. Meet new people. There are 30 new kids who have joined the class of 2020, and reaching out a hand to someone new could make their day. Also, don’t be afraid to make friends with people older than you. Just like teachers, they give great advice and it’s always beneficial to have someone to talk to outside of your grade. 5. Sleep! Sleep is very important to your health and not only will it help keep you focused in school, it will improve your work and productivity.